My Bromeliad Bloom Turned Brown. What Should I Do? 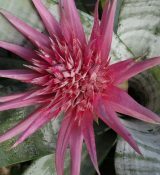 Bromeliads make excellent houseplants due to their vivid colors, unique features, and hardiness. Perhaps you picked one up for yourself or received one as a gift. Either way, it is important to know how to care for these fascinating plants so they may provide enjoyment for years to come. Bromeliads are quite a diverse family of plants. They range in size from small air plants to large terrestrial plants. Their foliage can be thick and fleshy or needle thin with sharp spikes. A bromeliad plant can be proportionally displayed or beautifully asymmetrical.